The geochemical prospection as a branch of Applied Geochemistry or “Geochemistry of the Landscape” studies the spatial and temporal location of geochemical anomalies in order to locate geological resources of economic value. The Ciénega de Chapala zone in Michoacán is located east of the Citala rift hosting a geological system that leads to regional hydrothermal activity, mainly the Pajacuaran and Ixtlan failures. The regional geothermics include a superficial hydrothermalism consisting of springs and wells of hot water with temperatures between 48˚C and 94˚C in Ixtlan de los Hervores and mud volcanoes in the water with temperatures between 48˚C and 94˚C in Ixtlan de los Hervores and mud volcanoes in the Los Negritos. The waters and gases of these hydrothermal manifestations have physicochemical characteristics that indicate the presence of geothermal fluids. To search for possible presence of minerals of economic value, a study of elemental chemical analysis was performed by scanning electron microscopy in samples of rock of the sierra de Pajacuaran, the result of the analysis is clearly abnormal values which may be indicative a geochemical anomaly as well as the possible presence of minerals of economic value in the region. Given the above, the area of the Ciénega de Chapala in Michoacán is a zone where work can be continued both geothermal and mineralogical exploration by conventional techniques or even totally innovative technologies. Based on the above, are developed methods for the study of geological objects based on geochemical and biogeochemical principles in search of data of abnormal presence of chemical elements (primary or secondary halos) forming geochemical anomalies , in order to detect economic deposits of geological resources   . Under this concept, coupled with the need for raw materials has had a spectacular development of geochemical prospecting methods, which also allow the detection of anthropogenic geochemical objects  . 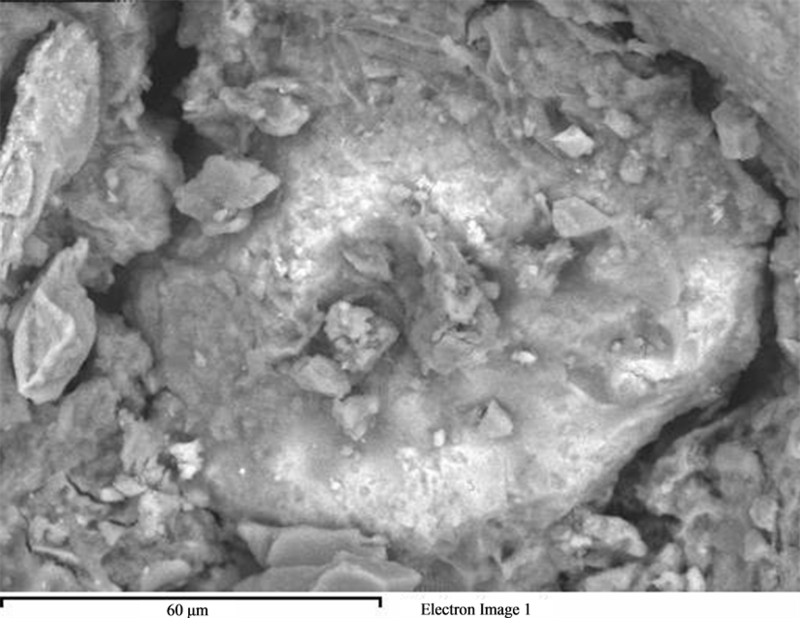 One of these methods has not been fully exploited in geochemical prospecting is the scanning electron microscopy (SEM) which is based on obtaining an image of a sample with a sweep of an electron beam. The interaction between the incident electrons and the sample causes the emission of secondary electrons, backscattered electrons and X-rays characteristic of the elements present in the sample, which is exploited for qualitative and semi-quantitative chemical analysis. In SEM, different detectors collect and amplify the signal emitted by the surface of the sample when it is scanned by the electron beam. The intensity of the amplified signal is displayed on a conventional screen. Recent advances in both equipment and software make this technique a potentially very powerful tool and not even used in earth sciences  . The Ciénega de Chapala zone in Michoacan is located east of the Citala rift leading to graben and Chapala Lake, the Chapala graben is bounded by a pair of faults that allow the geothermal activity in the region: the Pajacuaran and Ixtlan failures  (Figure 1). The Ixtlan failure is part of the northern flank of the Chapala graben with a length of 30 kmin NW-SE alignment along the bed of the Duero river, the fault is visible by a serie of surface hydrothermal manifestations   , while the Pajacuaran failure is part of the southern edge of the graben with a length of 20 km in EW direction   . The stratigraphy of the Pleistocene) that outcrop south of the region interspersed with lacustrine sediments, mainly siltstones and dolomites of Pliocene outcropping in the center west and north of the area   . the Ciénega de Chapala region is characterized for periods of volcanic activity in the past, and is precisely volcanic activity one of the geological precursor process of both mineral deposits and geothermal resources  , for it, is convenient a study of regional geochemical prospection. The regional geothermics include a surface hydrothermal consisting of springs and wells of hot water with temperatures between 48˚C - 94˚C in Ixtlan de los Hervores    and mud volcanoes in the Los Negritos  (Villamar). The waters of these hydrothermal manifestations are mainly of sodium chloride type with a boron content which indicates the presence of geothermal fluids, gases of these manifestations exhibit characteristic composition of geothermal gas. Geothermometers of both fluids result in average temperature of geothermal reservoirs (125˚C - 225˚C) for the area    . Moreover, the isotopy of water show an enrichment in oxygen 18 (18O) typical of geothermal environments   . All the above together features, can to indicate a geothermal reservoir of wide fracture (amplitude of fault greater than 100 m) of low relief with a water table of up to 3 m deep. Figure 1. Regional geological map. such as enhanced geothermal reservoirs in hot dry rock or even technical totally innovative. To search for possible presence of minerals of economic value a study of elemental chemical analysis was performed by scanning electron microscopy (Figure 2, Table 1) in samples of rock of the sierra de Pajacuaran, showing some remarkable crystals on its structure. The equipment used was a scanning electron microscope JEOL model 6610OLV. Technical Analysis: All elements analyzed (normalized). Figure 2. Morphology of rock sample of the sierra of Pajacuaran obtained by scanning electron microscopy. Table 1. Result of analysis. The result of the analysis of the rock sample of the sierra of Pajacuaran clearly indicates abnormal values which may be indicative of a geochemical anomaly as well as the possible presence of minerals of economic value in the region   (Gass et al., 2002, Viladevall, 2008). 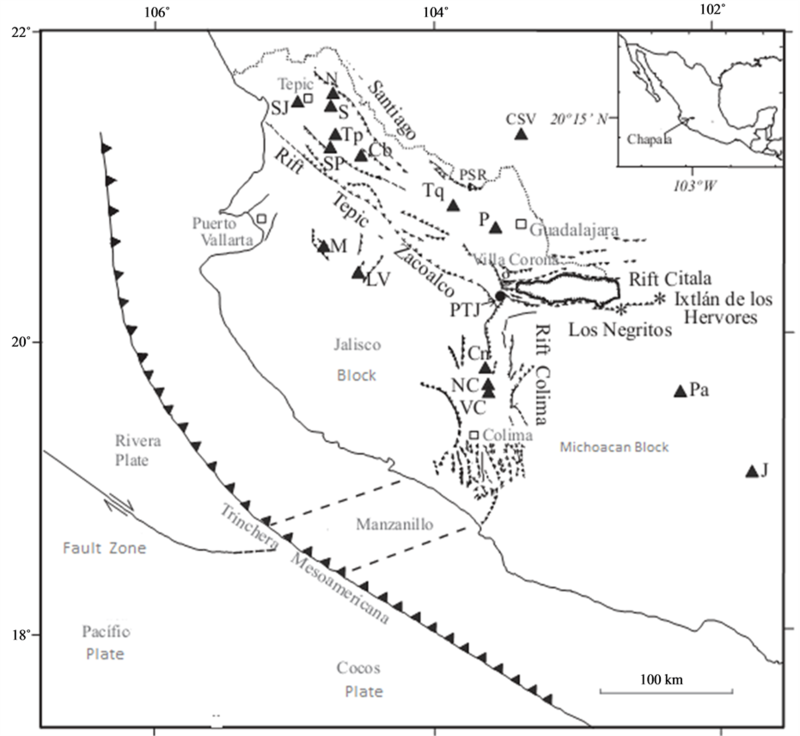 Through a study of geochemical prospection in early stage in the Cienega Chapala region of Michoacan state, can be identified geothermal resources in areas of Ixtlan de los Hervores and Los Negritos, Villamar, as well as the possible presence of iron minerals in the sierra de Pajacuaran. Viladevalli Solé, M. (2008) La Prospección Geoquímica. Universitat de Barcelona, Barcelona, 273 p.
Boyle, R.W. (1979) The Geochemistry of Gold and Its Deposits. Geological Survey of Canada, 280, 584 p.
Melgarejo, J.C., Proenza, J.A., Galí, S. and Llovet, X. (2010) Técnicas de caracterización mineral y suaplicación en exploración y explotaciónminera. Boletín de la Sociedad Geológica Mexicana, 62, 1-23. Gomez Tuena, A., Orozco-Esquivel, Ma.T. and Ferrari, L. (2005) Petrogénesisignea de la Faja Volcanica Transmexicana. Boletin de la Sociedad Geologica Mexicana, 52, 227-283. Rosas, J., Urrutia, J. and Maciel, R. (1989) Geologiadel Extremo oriental del graben de Chapala, breve discusiónsobresuedad: Zonas geotérmicas Ixtlan de los Hervores-Los Negritos, México. Geotermia, 5, 3-18. Viggiano Guerra, J.C. and Gutierrez Negrin, L.C.A. (2007) Estudio Petrografico y modelo conceptual Preeliminar de la Zona geotérmica de Ixtlan de los Hervores, Michoacán, México. Ingenieria Hidraulica en México, 22, 61-73. Rosas, J. and Olguin, A. (1981) Estudio Geologico de Ixtlan de los Hervores, Estado de Michoacaán. Informe Técnico Interno, C.F.E., Morelia, 43 p.
Quijano, J.L. and Chacon, M. (1982) Evaluación geoquímica de laszonasgeotérmicas de Ixtlan de los Hervores y Los Negritos, Mich. Informe Técnico Interno, C.F.E., Morelia, 28 p.
Tello, E. (1986) Caracteristicasquímicas e isotópicasdelagua de manantialestermales de laszonasgeotérmicas de Ixtlan de Los Hervores y Los Negritos, Michoacán. Geotermia, 2, 43-53. Zarate del Valle, P.F. and Simoneit, B.R.T. (2005) La generación de PetroleoHidrotermal en sedimentosdel Lago de chapala y surelación con la actividadgeotérmica del rift Citala en el estado de Jalisco, México. Revista Mexicana de Ciencias Geologicas, 22, 358-370. D’Amore, F. and Panichi, C. (1980) Evaluation of Deep Temperatures of Hydrothermal Systems by a New Gas Geo- thermometer. Geochimicaet Cosmochimia Acta, 44, 549-556. Tello, E. (1986) Química de los gases de laszonas geotérmicas de Ixtlan de los Hervores y Los Negritos, Mich. Informe Técnico Interno, C.F.E., Morelia, 13 p.
Gass, I.G., Smith, P.J. and Wilson, R.C.L. (2002) Introducción a lasciencias de la tierra. Ed. Reverté, Sevilla, 413 p.